This is NOT the official installation package for Content Enhancer. This package is only meant for evaluation and is NOT GPL. Once you purchase the product you will be able to download the full open-source GPL version. Note: This package can be used to evaluate the product for free. The evaluation works for 20 days with all features enabled. Note: This package is encrypted and requires the free ionCube loader to be installed on your server. 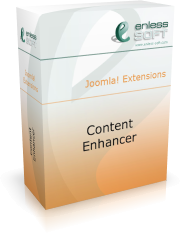 This is a version of the Content Enhancer manual in Microsoft Help format. It includes User's Guide and Developer's Guide.